Baden-Württemberg’s state airport goes for eco-friendly drives. From now on all vehicles that are not yet electrified will be refueled with a synthetic diesel. It is produced from residual and waste material as well as vegetable oil from certified sustainable cultivations. The change pays off twice: compared to fossil diesel the synthetic fuel reduces CO2 emissions by about 70 % and it emits significantly less air pollutants when burned. About 30 % less fine dust is produced while driving. The conversion to synthetic diesel not only protects the environment but also Stuttgart Airport’s apron staff. 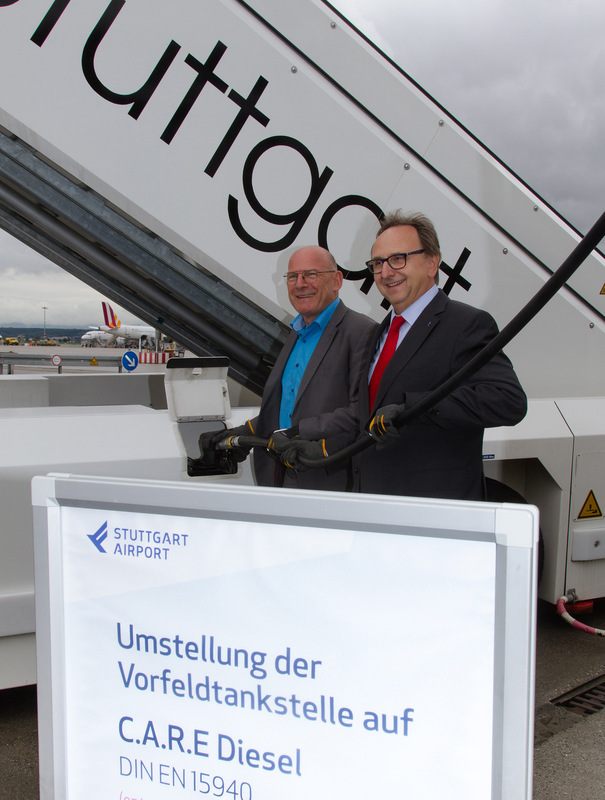 The synthetic diesel will complement where electric vehicle solutions are not yet ready to be used on the apron at Stuttgart Airport. Often there is no alternative on the market available, for instance in the case of airport-specific special purpose vehicles such as the trucks of the airport fire department or winter service equipment. Therefore, the airport operator is testing in this new long-term project whether the non-fossil fuel proves to be practicable in the current period of transition to e-mobility. „Being a fairport also means that we want to be a good example with our fleet. Our goal of running the entire airport climate-neutrally by 2050 is a very ambitious task. The use of C.A.R.E.-Diesel complements our previous efforts for climate protection and our apron staff benefits from it as well”, said Walter Schoefer, management director of Flughafen Stuttgart GmbH. The airport corporation is using the so called C.A.R.E.-Diesel by Tool-Fuel; an acronym for CO2 Reduction, Arctic Grade, Renewable und Emission Reduction. So far this alternative diesel can only be tested in closed car pools and fleets. The Ministry of the Environment, Climate Protection and the Energy Sector of Baden-Württemberg approved the conversion. Besides the airport operator itself, its subsidiaries that operate in Stuttgart as well as third-party companies that work on the apron will refuel with C.A.R.E.-Diesel. By switching to synthetic diesel, the airport operator moves a step closer to the new climate protection goals formulated in its fairport-program. Stuttgart Airport intends to half its greenhouse gas emissions by 2030 as compared to 1990. By 2050 Stuttgart Airport’s operations are to be entirely carbon-neutral. With its fairport-concept Stuttgart Airport strives to become one of the best-performing and most sustainable airports in Europe.